FEATURE — When choosing a fitness regimen there are many options. Gyms and group training classes can provide a good workout, but people suffering from chronic pain, recovering from surgery or athletes looking for more individualized attention may want to consider a personal trainer. Terese Schelling is a certified personal trainer and certified nutrition specialist working at Synergy Massage and Personal Fitness. With Schelling, clients get in-depth, personal training to not only help them meet their fitness goals but total body wellness. What sets Schelling apart from many personal trainers in the area is that she also has a post-rehabilitation conditioning specialist certification. For people who suffer from chronic injury or pain, or for those who are recovering from surgery, Schelling’s certification allows her to bridge the gap between physical therapy and going back to a gym. Schelling also works with people who have diseases and illnesses such as diabetes, fibromyalgia, arthritis, sacroiliac joint dysfuntion and others, who could benefit from exercise but need guidance to avoid pain and injury. No matter who the client is, whether they are healthy and looking for better fitness or dealing with health or injury issues, Schelling takes a whole body approach to personal training, beginning with a total evaluation. An evaluation can include a muscle imbalance test, range of motion testing and movement patterns to hone in on where each individual is needing stretching or strengthening. 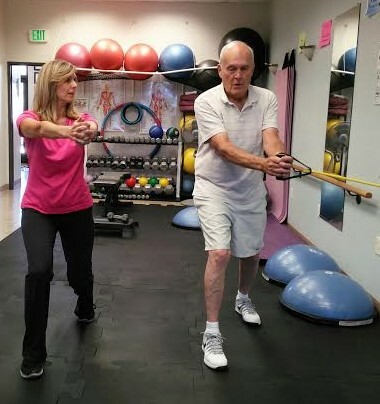 Schelling can then help balance, strengthen and stabilize her client’s body through exercises. “I’m looking for imbalances in those tests and then I put their program together,” Schelling said. Schelling said each session with her clients has been designed to take into account every thing that is going on with their bodies so she can get them back to the most healthy, balanced version of themselves possible. There are a lot of gyms that offer group training classes like boot camp or weight training that can give someone a good workout, Schelling said, but the programs are not individualized and don’t correct existing muscle imbalances. Balance has been a key component in Schelling’s own fitness regimen throughout her life. Schelling worked as a professional dancer prior to becoming a personal trainer, she said. As she was transitioning from dancing professionally, she wanted a career that would translate well and one that would use the physical foundation she had gained as a dancer. Schelling’s dance background and knowledge of body alignment coupled with her certifications in personal training and nutrition make her an ideal fit for Synergy Massage and Personal Fitness, a business whose very name represents bringing separate skills together to create an even stronger whole. At Synergy, massage therapists work complementary to personal trainers and nutritionists to really give clients the best chance at overall wellness. Schelling will often have clients with muscles that are so tight and contracted that they are unable to perform some of the exercises that would benefit them so she will refer them to one of Synergy’s massage therapists to release the affected muscles so Schelling can then have them perform the appropriate strengthening exercises. It is a relationship that goes hand-in-hand in helping the body achieve total health, Schelling said. At Synergy, energy, intention and knowledge combine to provide clients with a unique therapeutic massage and fitness experience in a private, safe and comfortable environment. Massage therapists, personal trainers and nutritionists work togther to help clients achieve their personal fitness and wellness goals. And each specialist remains committed to continuing education in their field and is up-to-date on the latest tecniques and sciences. Synergy Massage and Personal Fitness is located at 1495 S. Black Ridge Drive in St. George. For more information or to book an appointment call 435-688-2554 or visit the Synergy Massage and Personal Fitness website. Synergy Massage and Personal Fitness | Address: 1495 S. Black Ridge Drive, St. George | Telephone: 435-688-2554 | Website.